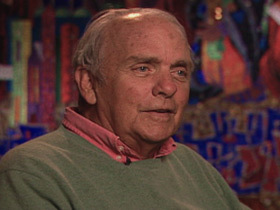 BOB ABERNETHY, anchor: Now, a profile of writer and preacher Frederick Buechner. He’s an ordained Presbyterian minister, but has never pastored a church and rarely attends one. His ministry is his writing: 32 novels and memoirs so far, and some sermons, as a guest preacher, many of which are in a new book, SECRETS IN THE DARK. Buechner and his wife live on a hilltop in Vermont, in what he calls “fathomless obscurity.” But for many Christians he’s a celebrity. 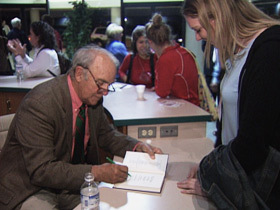 At an appearance at Calvin College in Grand Rapids, Michigan, a Christian school, a huge turnout to hear Buechner say he still feels, as he once said, that seeking ordination is the worst possible career move for a writer. Reverend FREDERICK BUECHNER: (Author, SECRETS IN THE DARK) (Speaking to Audience at Calvin College): Oh yes, I do, I do indeed. Supposing you were the Reverend John Irving, the Reverend Stephen King, the Reverend Joyce Carol Oates — who would touch it with a 20-foot pole? ABERNETHY: So how does Buechner write? Rev. BUECHNER (Speaking to Audience at Calvin College): I have tried to be as honest as I can be to my own experience: what it’s like to be alive on this planet. With a particular eye cocked to, a particular ear cocked to the elusive, ambiguous presence of God. ABERNETHY: And he’s glad he was ordained. Rev. 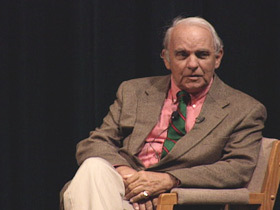 BUECHNER (Speaking to Audience at Calvin College): I wouldn’t have not been ordained for anything in the world. It gave me my passion. It set me on a path. It took me places I never would have found my way to any other way. ABERNETHY: Recently, another tribute to Buechner at the Washington National Cathedral. Very Reverend SAMUEL LLOYD (Dean, Washington National Cathedral): We offer you thanks and praise this night for the life and ministry of Frederick Buechner. ABERNETHY: Some of the country’s greatest preachers praised Buechner and acknowledged their debt for all they had borrowed from him. Reverend THOMAS LONG (Emory University): We are celebrating the ministry tonight of one whose eloquence has been imitated by all of us who dare to climb into the pulpit. Reverend BARBARA BROWN TAYLOR (Piedmont College): From you I have learned that it’s only when I give my full attention to what it means to be human that I am granted a glimpse of what it means to be divine. ABERNETHY: One reason for Buechner’s popularity is the underlying theme of all his writing. Rev. BUECHNER: Listen to your life. Pay attention. Pay attention to what happens to you. ABERNETHY: And then what comes from that? Rev. BUECHNER: Who knows? Who knows? Maybe nothing much, but maybe the secret of all secrets you need to hear may come through some event, something that happens or fails to happen. ABERNETHY: Often, Buechner reveals a mystical side. Rev. BUECHNER: What makes me a believer is that from time to time, there have been glimpses I’ve had which have made me suspect the presence of something extraordinary and beyond the realm of the immediate. You encounter the holy in various forms, which, unless you have your eyes open, you might not even notice. 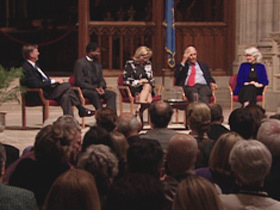 ABERNETHY: At the National Cathedral discussion, Buechner advised pastors to tell the truth and speak in their own voice, out of their own experience. In our conversation he also described what he thinks people in church most want to hear. Rev. BUECHNER: Is it true? Is it — can it be true that there is a God who is loving and wise and powerful? Every congregation I address I always try, in some way or another, to answer the question. Often the sign of it is tears in your eyes. It means you are in touch with something profoundly important, profoundly human, profoundly holy. That’s what I try to do in my preaching. ABERNETHY: Many people tell Buechner he has succeeded. Rev. 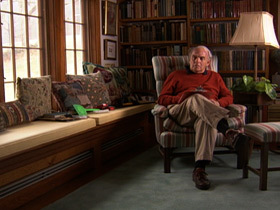 BUECHNER: Something I have touched upon, something that has touched me, and through me them, that has saved their life. And that’s something I love more than anything else to do. ABERNETHY: I asked Buechner what advice he gives young people seeking a career. Rev. BUECHNER: The vocation for you is the one in which your deep gladness and the world’s deep need meet — something that not only makes you happy but that the world needs to have done. ABERNETHY: Buechner also spoke about why he does not go to church more. ABERNETHY: When he is writing, Buechner says, it’s like a form of praying because what he’s doing is listening. Rev. BUECHNER: Listening to the deepest level of myself for what of truth, for what of hope, for what of beauty, for what of meaning may be there. ABERNETHY: Buechner acknowledged that the world’s suffering is a challenge to faith in a loving God. Rev. BUECHNER: You cannot help, I think, if you are honest with yourself, say[ing], “Well, maybe this whole holy business is just a lot of hogwash. How do I know I’m not just trying to keep my spirits up?” But I’ve never come out on that side. I’ve never given up this profound sense that all ultimately is well. Beneath the worst the world can do, there is always the glimmer of best. ABERNETHY: What do you say to people who cannot come out that way? Rev. BUECHNER: You might be right, you might be right. Maybe I’m kidding myself. But don’t write it off too easily. Don’t write off the possibility of the holy too easily. Keep looking. ABERNETHY: Buechner also recalled words that had come to him when he was writing about an aging medieval monk named Godric. Rev. BUECHNER (At National Cathedral): What’s lost is nothing to what’s found, and all the death that ever was set next to life would scarcely fill a cup. ABERNETHY: Buechner said he would like those words on his tombstone. Buechner doesn’t mind being thought of as a kind of theologian. Rev. BUECHNER: The word “God,” at least to me, means a loving, creating, everlastingly renewing presence deeply concerned with the well-being of the earth and all its creatures. ABERNETHY: His politics are straight from the Gospels. Rev. BUECHNER: The Jesus that I follow is the peacemaker. It’s one who says forgive your enemies, who worries about the poor, who worries about the poorest of the poor instead of the richest of the rich. ABERNETHY: At the tribute to Buechner, as the panel discussion flowed on, Buechner decided it was time to go home. So he took over. Rev. 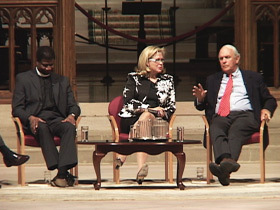 BUECHNER (At National Cathedral): I have a feeling we have talked enough — that we need silence. Not much — three minutes; to spend three minutes not saying a damn thing. Can we do that? Are we brave enough to do that? ABERNETHY: Somewhat surprised, that’s what everyone did. 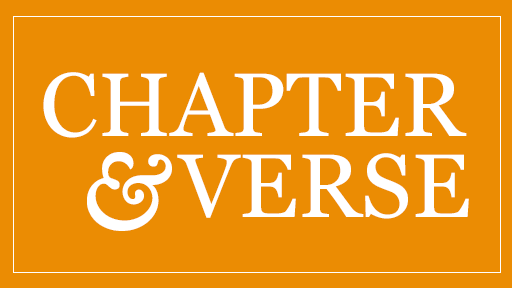 Until the Reverend Fred Buechner pronounced a benediction. Rev. BUECHNER (At National Cathedral): May the Lord bless you and keep you. May the Lord make his face to shine upon you and be gracious unto you. May the Lord lift up the light of his countenance upon you and give you each other, give you peace, give you life both now and forevermore. Amen. SHADOW & LIGHT: LITERATURE AND THE LIFE OF FAITH edited by Darryl Tippens et al. Read an excerpt from SECRETS IN THE DARK: A LIFE IN SERMONS by Frederick Buechner.